You know those kind of iconic duos in movies that practically everybody knows? Woody and Buzz Lightyear? Marlin and Dory? Harry Potter and Ron Weasley? Tom & Jerry? They definitely all have something that is unique and it’s the reason why they are so popular and loved, if not all, by everybody. They each have taught us something meaningful with regard to their friendship and what they go through. I mean, who hasn’t heard of them? They’re classics! 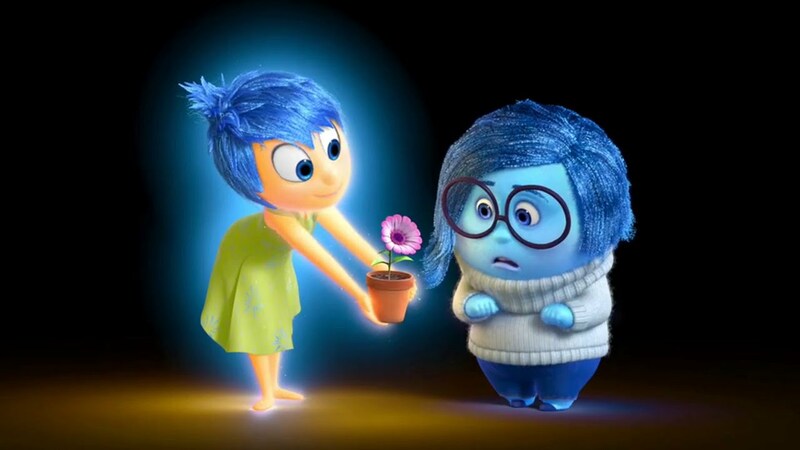 And here comes another newly-classic duo—Joy and Sadness from Disney and Pixar’s Inside Out that deals with personified characters trying to lead Riley’s life inside her mind as she struggles adapting to her new home in San Francisco and her complex interpersonal relationships at home and in school. While Fear, Disgust and Anger are also three other main manifested emotions in the mind of Riley, there are a few reasons why Joy and Sadness still can be considered on the same level as Woody and Buzz Lightyear’s level. In the beginning, Joy tries to isolate Sadness from touching Riley’s happy memories as they can turn sad. This causes an upsetting twist when Joy and Sadness get sucked out of their Headquarters where they can maintain Riley emotional state— and they find themselves in the rest of Riley’s mind (outside the Headquarters). Majority of the parts in the movie consists of Joy and Sadness’ journey of trying to return back to the Headquarters in order to control and make Riley emotionally stable again. Throughout the movie, the audience witnesses their journey together trying to venture out and head back to the Headquarters. At some point, they were close but majority of the time, they fail. While they are two exact opposites, they still work together. I think the main important reason why they can be considered an iconic duo is because of the fact that they both symbolize the complexity of emotions that people tend to not want to accept; the fact that happiness cannot happen without going through the sad moments first. I, for one, once thought that in order to feel complete happiness, you have to be happy all the time and completely try to avoid anything that may cause you to fall into the state of unhappiness. But no. That shouldn’t be the case. We can’t have a rainbow without a little rain, can we? Joy and Sadness depict that certain truth in a way so simple nearing the end of the movie when Joy starts to realize how important Sadness is for Riley’s emotional state—which is to help Riley accept that she is sad about her new life in San Francisco. To also accept that she wants to go back to her old home because she misses it, which later in return causes her parents to realize what Riley has truly been feeling all along. Joy then happily takes over, making Riley feel happy again with the support of her family and their comfort. Basically, Joy and Sadness represent the fact that it is okay to feel sad. To feel and show vulnerability is okay because if we don’t show it and just bottle everything in, how can we truly be happy again? Basically, Joy and Sadness teach us that we have to go through the sad moments first in order to feel that sparkling bit of happiness again because that’s when things can start to grow. Your interpersonal relationships, your life, your perspective of things. You, yourself can too. This is undoubtedly so simple to comprehend—but for young children nowadays who are still growing and experiencing the real world as they grow, Joy and Sadness are here to help them understand in no way other Disney characters has ever before—and that’s pretty iconic.